Last modified on December 10th, 2014 by Joe. This Android tutorial will walk you through to create an Android application to receive SMS messages in your Android mobile. SMS is popular utility now loosing sheen to Internet based instant messenger services like Whatsapp. We will be using a BroadcastReceiver to receive the messages and parse the SMS message out of it and update our UI. We will also show a toast message. 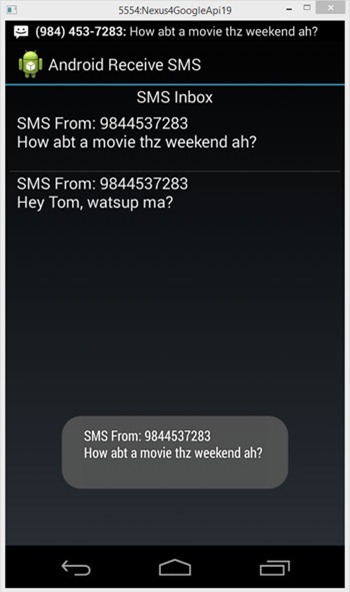 In a previous Android tutorial to send SMS we created an app to send SMS messages. These two tutorials combined together will create one complete SMS Android application. Application uses the basis Android constructs. We should know about using BroadcastReceiver and using Android ListView. Knowing these two is enough to build this Android SMS application. Couple of things to note in the Android manifest file. Add permission to receive, read and write SMS to the application. Then add the broadcast receiver with an intent-filter to receiving SMS. This is a BroadcastReceiver which receives the intent-filtered SMS messages. onReceive, we extract the SMS message bundle and show a toast message and also update the UI by adding the SMS message to the SMS inbox list. When a SMS message arrives, the inbox is automatically refreshed. This is the main Android activity of the SMS application. It acts as the SMS inbox. It has a ListView to show the SMS messages. onCreate we read all the messages present in the internal SMS inbox from its Uri and show them using the ListView. Following is the layout file. We need not have a real Android mobile to test this Android application. 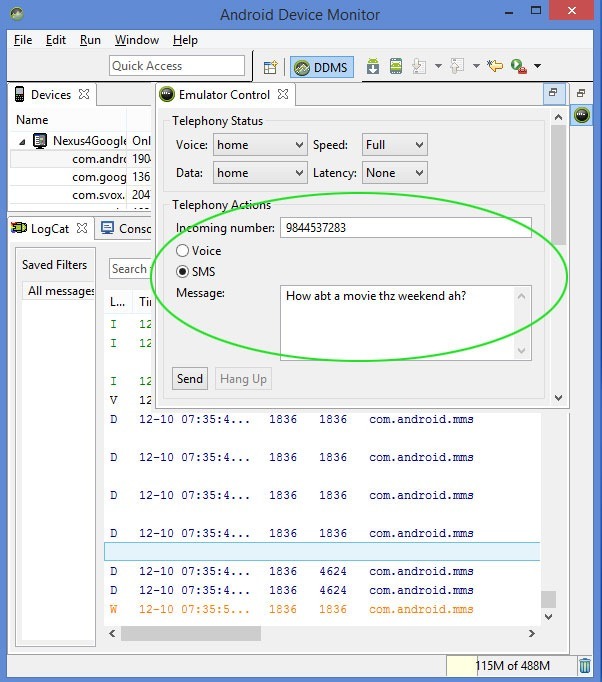 The Android emulator provides the facility to send test SMS messages to the deployed app via the DDMS Emulator Control as shown below. Comments on "Android Receive SMS Tutorial"
how can I keep this app running in the background as u can c dat when u send an SMS when the app is closed it will not activate the app on its own. This is a great tutorial for a practical use of a broadcast receiver, and having it update the UI. provide a tutorial on file transfer using nfc and bluetooth and using internet ………. Thank you , this only post that work for me !! tell about the coding for sending and receiving sms by using internet..
Hi this tutorial works but may i know how to open a link that is sent to us through this inbox from someone. I am having difficulty with it since its a list view. The example seems to send okay, but receiving SMS messages seems to cause it to crash (and the default SMS app receives the incoming text). I assume this is due to the restrictions added in 4.4. What steps would you need to take to make this app appear as a candidate to become the default SMS app? Comments are closed for "Android Receive SMS Tutorial".